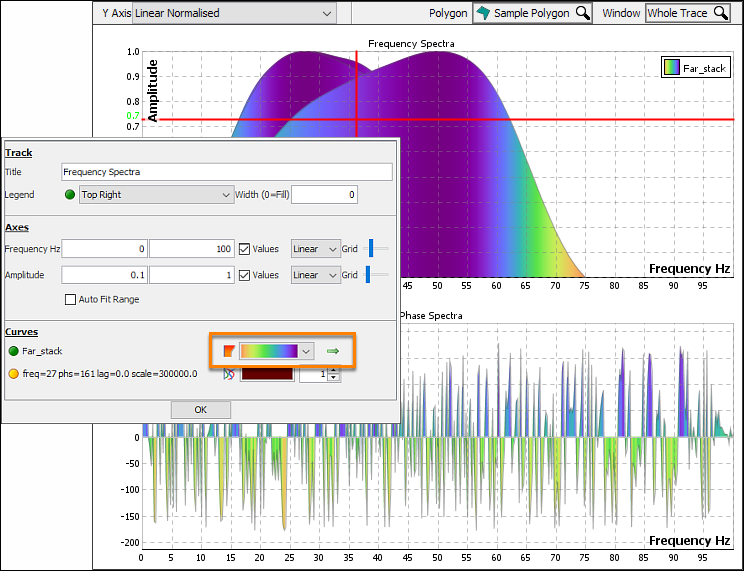 Select the type of Y-Axis for the spectra plot. 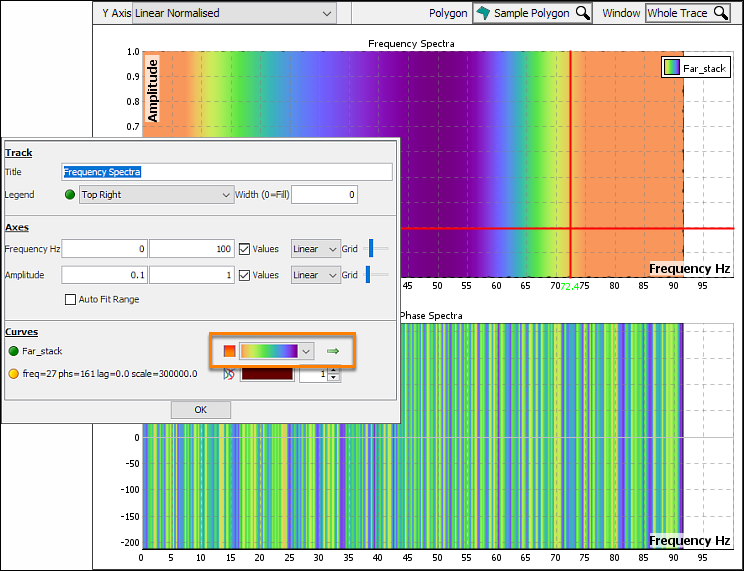 Linear Normalised: Independently scale spectra to a maximum amplitude of 1 (default). Linear Normalised (P90): Independently scale amplitudes such that 90% of frequencies are below 1.
dB: Spectral amplitudes in decibels. dB Down: Independently scale spectra (in decibels) to a maximum of 0.
dB Down (P90): Independently scale spectra (in decibels) such that 90% of frequencies are below 0. Click the spanner icon at the top left corner to open the settings window. 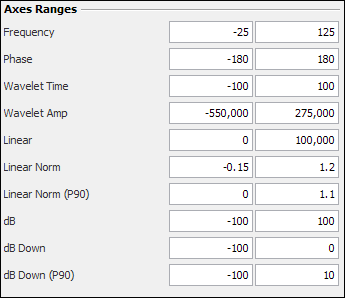 dB Down (P90): The Y-Axis range for the dB-Normalised-P90 axis. When using a window model to choose a vertical interval. Max Moveout First Interface (ms): The "droop" at the maximum offset (or other fourth dimension in the model) at the first defined interface. As the offset increases, the time window shifts downward with the moveout. The shift at the maximum offset at the last interface is hard-coded at 10 ms. 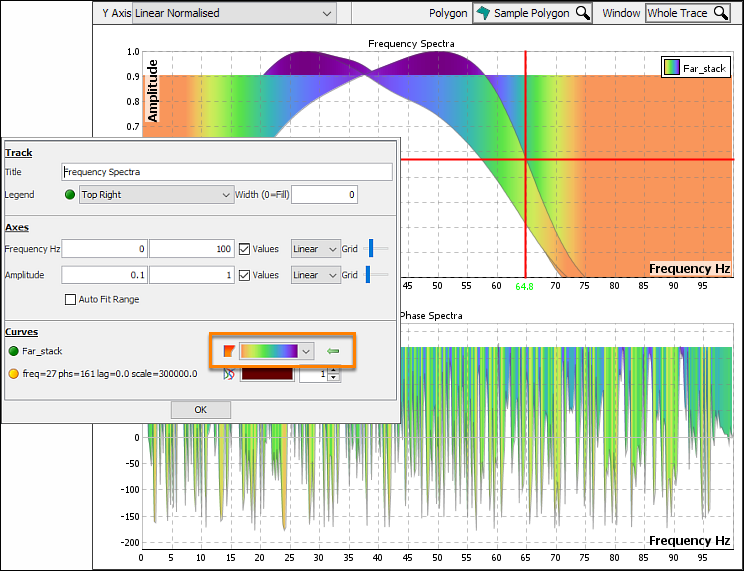 Tip: Define windows and intervals using window models (see Creating a Windowing Model). Window models and their layers are listed in the Window selector at the top of the view. 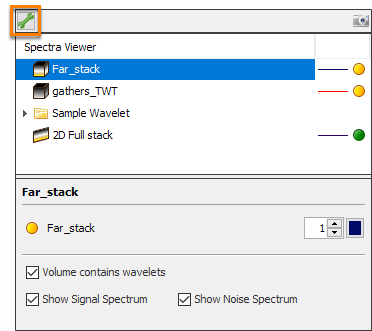 By default, spectra are smoothed across frequencies. Uncheck this box to disable smoothing. The width of the applied smoothing, in Hertz. Right-click in the chart panel and select Configure Track. Width: Set the chart width in pixels. Use zero (0) to autofit. Override or configure each spectrum. Line curve: A line with colour, opacity and thickness.